Our initiative will provide affordable housing and economic opportunity to the fastest growing cities in developing countries. We will manufacture modular homes in facilities that train and employ people at the base of the pyramid through a mission-aligned partnership between experts in affordable housing, manufacturing, and social impact investment. This initiative is still in its conceptual stage and, as such, management innovation is forthcoming. We are in the process of identifying a housing NGO, manufacturing partner, and social impact investment fund to create a new venture. This sort of collaboration is indicative of the rise of shared value partnerships and the need for multiple organizations to bring forward their specific expertise and strengths to solve large global challenges like inadequate housing. No one can address the magnitude of such a challenge alone. For the housing NGO, its mission would be to provide affordable and quality housing to people living at the bottom of the pyramid, with incomes as low as $1-$2 per day, and a keen understanding of their needs. For the manufacturing partner, we envision a company that has a strong social mission to transform lives and enable communities with its products and/or innovations, as well as expertise in efficient manufacturing processes, which is necessary to build quality modular housing in an affordable way for low-income populations. For example, TATA Group redirects more than half its profits toward charity with an aim to build capacity in low-income Indian communities. It develops products, including modular housing, that are extremely affordable and accessible to low-income earners. The social impact investment fund would enable this venture through its mission to transform lives at scale with patient capital. By investing in projects such as this, Acumen Fund or a similar organization can accelerate the speed of implementation thanks to investments in upfront capital and financial risk sharing. To date, we have been given introductions to individuals at TATA Group, GE, Habitat for Humanity International, Acumen Fund, and Unitus and we are in the process of identifying the right people within these or similar organizations to further develop the model. We have already spoken with Ford Motors about helping support the pilot through donations and thus far they have been supportive of the idea. The rapid influx of people from rural to urban areas is slated to increase at a dramatic pace over the next 20 years. Currently there are 1.6 billion people who lack adequate housing. The United Nations projects this number to escalate to 3 billion by the year 2030. This influx of people will increase the number of people living in slum dwellings, who are victims of diseases due to lack of sanitation, and who lack stability and education to rise above their circumstances. We are witness to a large and growing inequality gap. Several organizations have tried to respond to the need. Microfinance institutions (MFIs) are increasing access to credit for low income individuals, but still those in the lowest income bracket are frequently left behind. For-profit companies such as the TATA Group are working to address this social problem while simultaneously positioning themselves for a financially sustainable future by developing scaled modular housing communities for the base of the pyramid target segment. Other examples include Ikea, which has developed affordable, easy to assemble modular house designs; and the $300 House challenge to design a safe home for the very poorest slum populations. Additionally, the increasing numbers of disasters have left some of the most vulnerable communities without adequate shelter. Those working to address this problem have turned to modular housing as a faster, lower-cost solution. Through our plan, not only could we provide more access to stable, affordable housing at scale in growing cities, but our manufacturing facilities would have the capacity to deploy affordable modular housing to victims of natural disasters when needed. 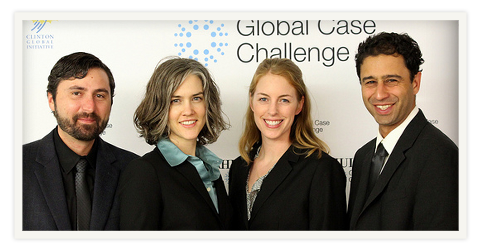 Our team was selected to compete in the Hult Global Case Challenge, where we were tasked to help Habitat for Humanity International build 10 million houses in 10 years for people living at the bottom of the pyramid. Our solution originated through a conversation with William Shutkin, President and CEO of the Presidio Graduate School and former faculty in the MIT Planning Department. We further developed and matured our solution through research and conversations with other experts working on innovations and market-based solutions around affordable housing and poverty internationally. Our concept involves a fundamental shift in thinking about the NGO’s current business model. It would require them to greenlight a for-profit entity that is less vulnerable to the ebbs and flows of donor donations. It would employ the use of disruptive modular technology to achieve efficiency and cost savings in order to deliver affordable housing solutions for extreme affordability. We envision an organization such as Habitat for Humanity International, historically dependent on donations and volunteers to meet its goals; or Terra Housing, dependent on policy breaks and government or cross-market subsidies. By creating a market-based solution that offers benefits to all partners, including the communities and governments where the initiative gets implemented, we can bring housing to people in need through a self-sustaining and attractive model. We would implement this concept initially through a pilot to prove the concept, establish the supply chain, and work out the kinks. We envision the pilot would take one to two years, after which we would gradually replicate our model and scale to other cities worldwide. While this idea is still in its conceptual stage, we have thought through the various challenges and risks in implementing it. To help overcome these challenges and risks, we have carefully thought through how to distribute risk and responsibility to the respective partners based on their strengths and expertise. Each partner would address its specific area of expertise so that the other partners do not have to bear the risks of areas where they do not already operate. For example, the manufacturing partner would have a deep understanding of labor rights, laws, and trends in its countries of operation. Additionally, we would alleviate some of the up-front capital risks through leasing or borrowing rather than buying manufacturing equipment. We would seek patient capital and/or philanthropy to fund the up-front capital costs and pilot phase so that the manufacturing and housing partners do not have to bear all the risks in getting started. To help address labor instability and ensure that end users pay back their mortgages, we would use the Grameen Bank model. Our vision is to socially align every single employee and mortgage loan recipient. This will help ensure that employees want to stay at their job throughout the program, with personal follow-up to ensure repayment. Additionally, if loan recipients cannot make payments, community banks could serve as a back-up funding source, creating more social pressure to come up with a way to pay back the loan. To help address and work through the risks of this venture as a whole, we would start with a feasibility study to focus on the areas of greatest risk and then develop one or two concurrent pilots in different cities to train the first employees and build the first houses. To help illustrate innovations to build houses at scale, Habitat for Humanity has had tremendous success with its blitz model, in which it crowdsources a large number of volunteers for specific and targeted campaigns to build hundreds of homes in less than a week’s time. Yet even with the success of its blitz campaigns, Habitat barely scratches the surface when one takes into account the number of people without sufficient housing, and the amount of time and resources to organize the event is immense and unsustainable. Furthermore, this model is strictly volunteer-based. No one gets paid to do this work, and in fact many of the volunteers pay to participate in a blitz. This is precisely why our plan is so ambitious in scale and impact. The lessons we learned in developing this concept include the importance of creating shared value in the joint venture. To be successful, we must develop a venture that is a win for all parties. Additionally, while the initial goal was to increase the production of houses to bring more stability to more people, through this venture we are providing not just shelter but also the means to afford and obtain shelter for oneself. From resistance from potential partners, we learned that we must carefully understand the risks and address them one by one to bring confidence to a bold and risky idea. Communicating value effectively is an essential piece in this challenge. As this concept unfolds, we must never lose site of the end users’ needs, context, and culture in selecting the right partners, the right house design, and creating meaningful work and economic opportunity. We must also never lose site of the fact that we are outsiders coming in to do this work, which may be perceived in a negative light. Develop trust through the choice of partners, and engage the community throughout the process to ensure that they actually want and will participate in what we offer. We suggest to others that they understand the need, identify the goal, then determine who is best positioned to address the need to meet the goal.